Samsung monitors have never been tough to understand. Their equipment is almost always exactly what it appears to be. Because Samsung tends to make monitors for general audiences. Most people want to have their monitor turn on, work, and look good. And that’s about as complicated as they want things to be. Almost the entire Samsung lineup is made to accommodate the needs of that kind of audience. 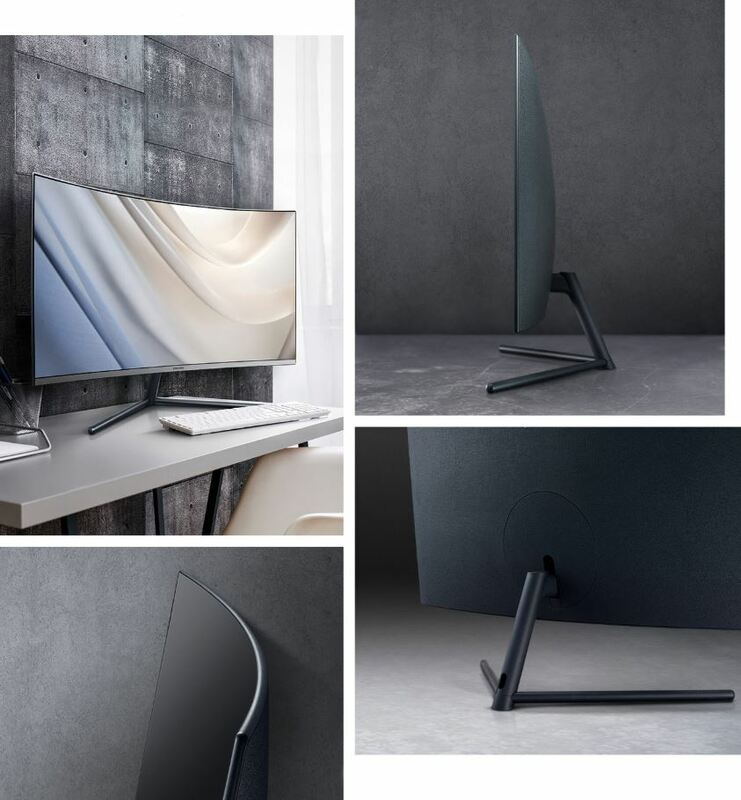 Apart from the features highlighted in its name, the Samsung U32R590 Curved UHD 4K Monitor also features quantum dot technology, an effective vertical alignment panel, and a number of similar perks. Depending on your viewing distance, going with 4K resolution usually makes sense on a 32” panel. In one sense, being 4K capable means this panel might be considered future-proof. The U32R590 doesn’t have a particularly competitive price, or any truly unique features. The price of 4K panels been decreasing over the past couple of years, but Samsung’s pricing is set to match rather than beat the average. You shouldn’t turn to this brand if you’re looking for a monitor with an unusually high dollar to performance ratio. Instead, Samsung is really more about reliability and general quality. We’re basically talking about the difference between a generic and a mainstream brand. Sometimes it’s easier to know what you’re getting, and that’s certainly the case with the U32R590. 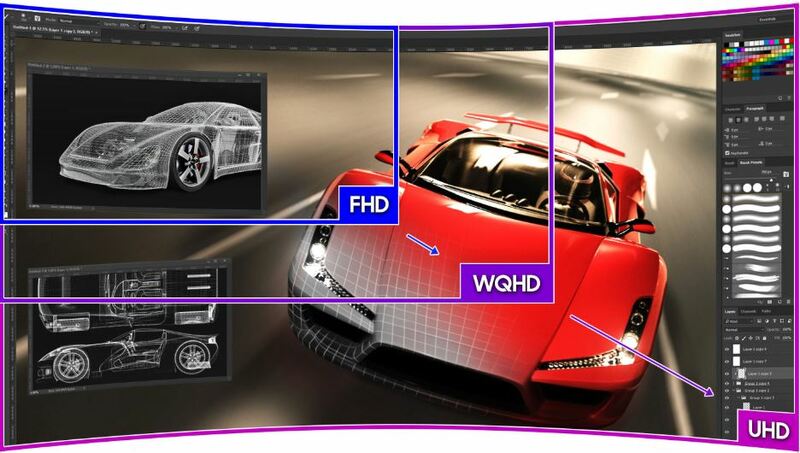 You might not be aware of this, but Samsung makes the panels used by several monitor brands. Even when you’re buying a monitor from a major brand like Acer or ASUS, there’s a good chance the panel was originally constructed by Samsung. Additionally, the narrow bezel you see on the U32R590 is strikingly similar to many bezels used by those brands as well. Once again, that’s because many of brands use the same provider for bezels. They’ll move on to sticking the bezel onto the panel, adding some kind of monitor stand, and selling the monitor under their own name. Even if you don’t use a Samsung monitor currently, the chance is almost 50/50 that whatever monitor you have, it has parts made by Samsung. While considered a 32” monitor, this screen is technically 31.5” from corner to corner. Even from a quick glance, it’s hard to miss the curvature of this screen. It’s a gentle but highly present 1500R curve, pretty clearly intended for the sort of nearby viewing distances you’d expect people to use with a panel like the U32R590. 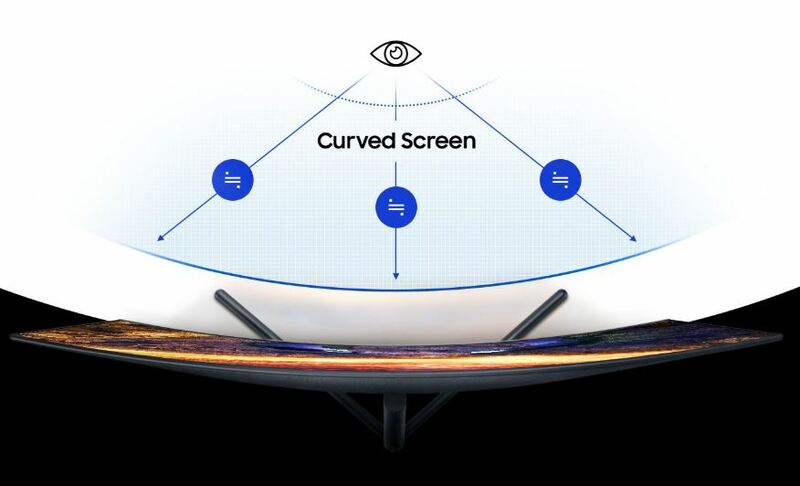 For people who are sitting only a couple of feet away from their screen, the curvature should prove to be immensely immersive. When you start to move your viewing distances towards 4ft or 5ft, that’s when the value of curvature starts to rapidly disappear. It also diminishes quickly if you’re viewing the screen from an indirect angle, though the color vivacity and image remain pristine. 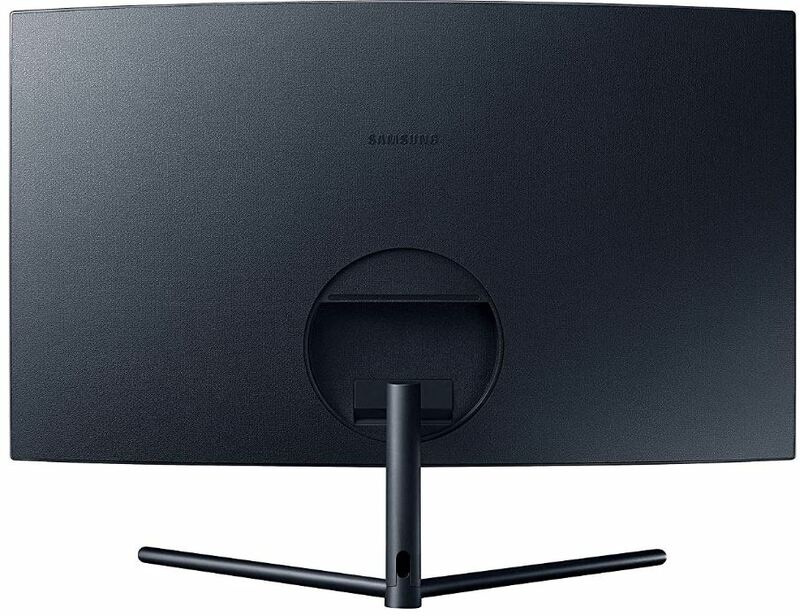 The Samsung U32R590 4K Monitor was constructed to provide full VESA support, allowing you to mount this monitor onto basically any third-party monitor stand. But there’s no big rush to replace the stand because the included stand is quite respectable. It’s a metallic Y-stand that looks modern, but simple. It doesn’t take up much desk space, though the legs of the stand do reach nearly as far as the length of the monitor. With only a quick look, it might seem like this stand isn’t going to be very supportive. But it places the center of gravity of the U32R590 right where it needs to be. With respect to adjustability, the stand is made to pivot, tilt, swivel, or otherwise adapt. It even has a couple of inches of height adjustment, something desperately lacking from most monitor stands. It’s easy to underestimate the importance of height adjustment until you’ve become accustomed to using it. 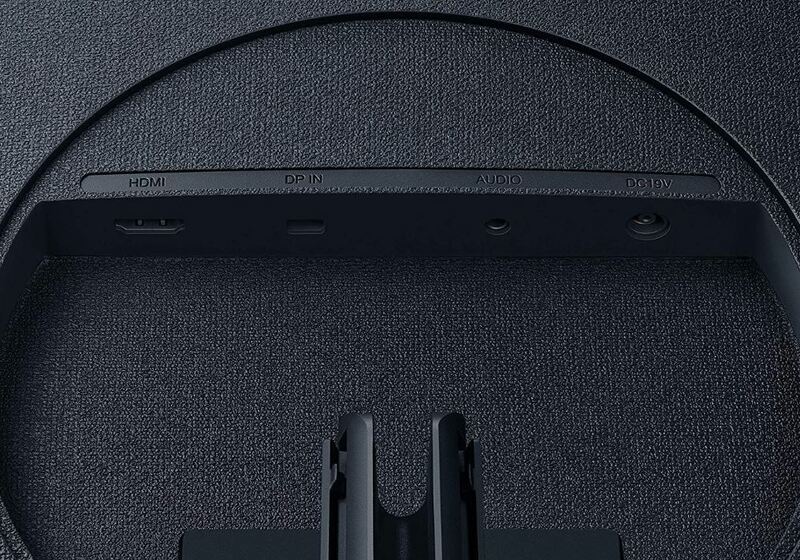 When you go looking for input ports, you’ll notice the backside of the panel is covered in a texturized fabric. It doesn’t just feel nice; it looks much cooler than the bare plastic designs that we’re all used to seeing. Apart from the cool fabric, you’ll find one HDMI port, an audio input, and one mini DisplayPort. Unfortunately, there aren’t any other connection options for older graphics cards. But for anyone who plans on taking advantage of 4K resolution those kind of connections wouldn’t be sufficient anyway. Moreover, this is nothing a simple adapter couldn’t fix. The use of quantum dot technology means the UH850 can deliver a billion shades of color. For the sake of comparison, standard LED monitors can typically offer about 16 million colors. The general idea is to create better-looking images by heightening the accuracy of color. Because this is a vertical alignment panel, you get wide viewing angles of about 178°. That’s possible both horizontally and vertically. The U32R590 has a native resolution of 3840 x 2160, more commonly known as 4K. About the smallest you want to make a 1440p monitor is about 27”, and about the largest is 32”. Bringing 4K resolution to the 32” form factor, the U32R590 picks up at the tail-end of what’s reasonable to use for 1440p. If you’re sitting back a couple feet from your monitor, then you won’t get any visual benefits compared to 1440p. But if you can reach out touch your screen, or get close to touching your screen, then you’ll be able to enjoy the 4K. Finally, there’s a little bit of bad news. The Samsung U32R590 delivers brightness of 250 cd/m2, which isn’t going to be enough power for this panel to achieve HDR certification. It’s also responsible for the contrast ratio clocking in at 3000:1. For a great cinematic experience, that’s pretty much ideal. It’s certainly much better than the standard LED panels that so many people are used to working with. But it doesn’t compare with panels made specifically to deliver HDR color contrast. The Samsung U32R590 Curved UHD 4K Monitor provides a respectably response time of 4ms. That should be enough for both gamers and non-gamers to be totally satisfied. Though technically speaking, a gaming monitor might want to drop that response time closer to 1ms. Besides having laid the foundation for a color-rich, high resolution display, there aren’t any special gaming features to be found. There aren’t any FreeSync features, either. That’s actually a pretty big bummer because of the recent news that G-Sync will now be supported on all FreeSync monitors. Additionally, there aren’t extra high refresh rates. In order to get refresh rates in excess of 60Hz, you’d have to find a monitor that costs about the same as a used car. 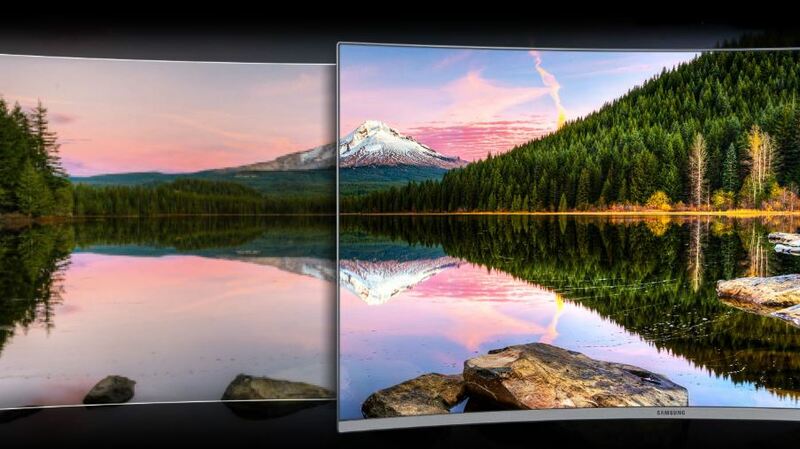 Unfortunately, 4K panels will not be able to provide those kind of refresh rates with reasonable pricing, at least not anytime in the foreseeable future. Samsung brings their own feature set to whatever monitor they make. For the U32R590, that mostly means basic things like picture-by-picture and dual-screen functionality. Letting you split your screen into picture by picture mode is great for people who are trying to replace two monitors. The picture-in-picture mode is similar, but it allows you to operate the second screen as a separate entity. Depending on the type of workspace you’re trying to create, there are advantages and disadvantages to either mode. But it’s nice to be able to get the functionality of two panels in one, which is basically what you’re getting anytime you select a monitor 32” or larger. Among the continuing list of features this monitor does not support, HDCP 2.2 is unfortunately included. That can get in the way of streaming. But unless you know for certain you need HDCP 2.2, then you can ignore this limitation. This panel does not have any built-in speakers or built-in webcams. If you want either of those things, you’ll need to attach a separate unit through one of the USB hub ports. It’s probably no coincidence there are two USB ports. Out of the box, you’ll need to make some color calibration changes. Many people don’t realize the importance of making calibration changes to their monitor. That importance is doubled when you’re using color-rich equipment like the Samsung U32R590. Fortunately, the process of calibrating colors on a PC monitor is far easier than almost any other type of screen. 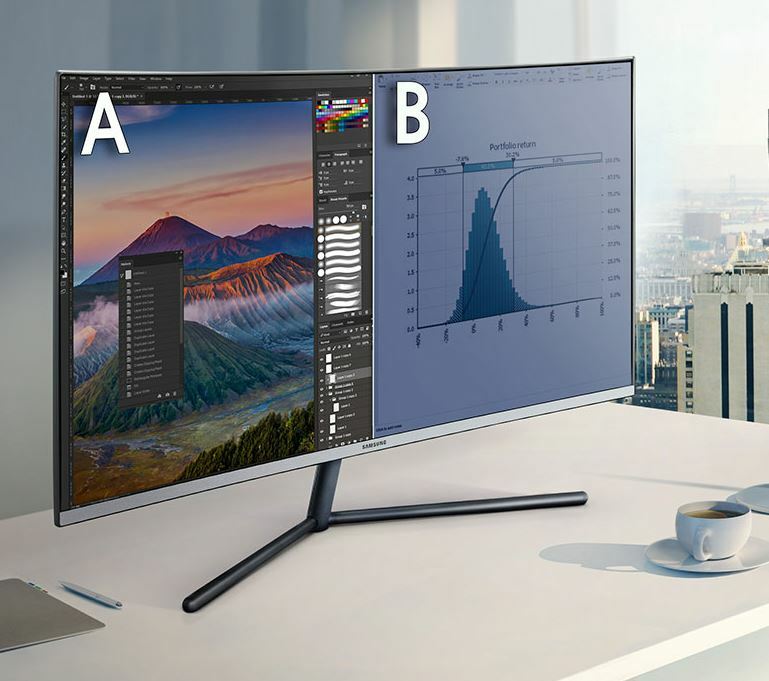 When you’re using monitors made by big-time manufacturers like Samsung, it’s almost always possible to download pre-made color calibration profiles, and then install them for yourself. Out of the box, you’ll probably be impressed by how this panel looks. But calibration can make it even better. 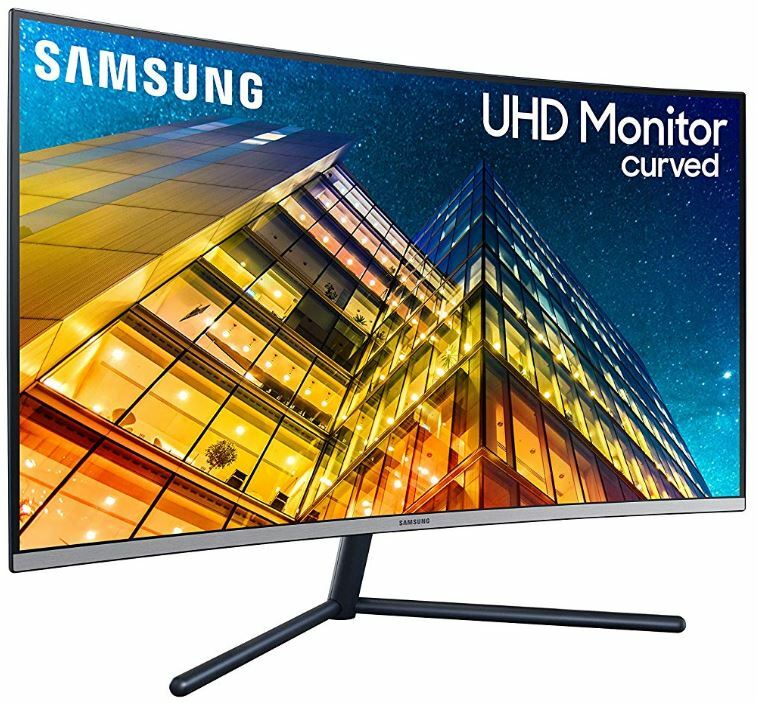 Who Should Choose the Samsung U32R590 Curved UHD 4K Monitor? It feels as though this monitor wasn’t made for any specific person. The U32R590 doesn’t have next-generation color features. Having a billion colors to work with is certainly better than the more common alternative, but it’s not as good as high dynamic resolution (HDR) content. It doesn’t have current generation dynamic sync technologies. This panel could be used for playing games, but if you were looking specifically for gaming features, you’d want technologies this panel can’t offer. There’s nothing truly special that sets this panel apart. In fact, it’s actually trying hard to aim for the middle. The included stand is pretty impressive. Though it looks like its basic and simple, it can actually provide a truly deep range of adjustability. That’s easy to appreciate because viewing angle really matters if you want to make the most of this kind of screen. 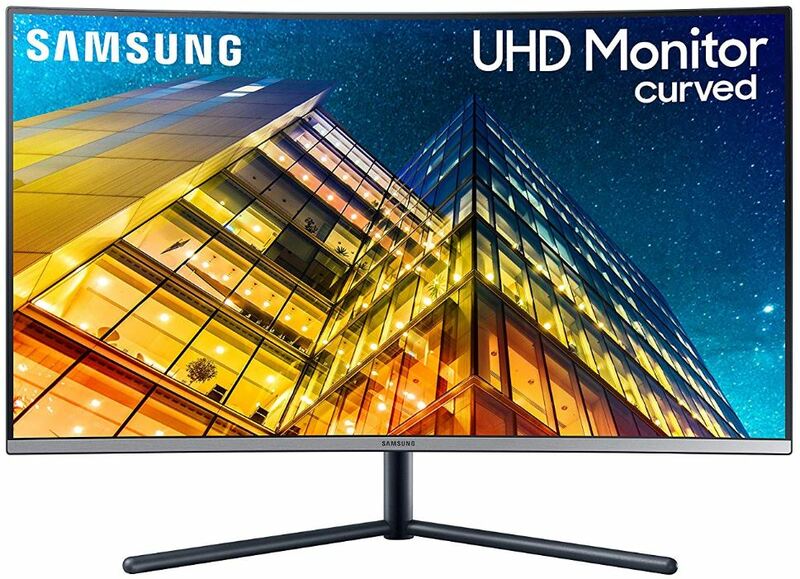 All in all, the Samsung U32R590 Curved UHD 4K Monitor is a good choice for someone who doesn’t care about special features. It provides a simple and effective workspace from a respectable manufacturer. And what would be a better general purpose 32″ 4K monitor?